NEW YORK - Detroit was rewarded Thursday night for one of the best starts in NBA history when four Pistons made the All-Star team as reserves. 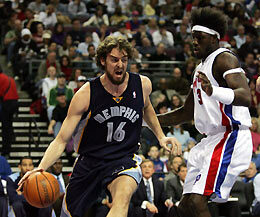 Memphis Grizzlies forward Pau Gasol (L) drives past Detroit Pistons center Ben Wallace during the first half of their NBA game in Auburn Hills, Michigan January 27, 2006. Chauncey Billups, Richard Hamilton, Ben Wallace and Rasheed Wallace all were picked for the Eastern Conference team that will be led by Detroit coach Flip Saunders. Tayshaun Prince was the lone Pistons starter not chosen in voting by East head coaches. "I would just like to thank the coaches in the league for recognizing our players," Pistons president of basketball operations Joe Dumars told The Associated Press on Thursday night. "What the coaches are saying by voting our guys on is that they appreciate unselfishness, great attitudes and team basketball." The Pistons (40-8) became the first team with four players in an All-Star game since the Los Angeles Lakers sent Shaquille O'Neal, Kobe Bryant, Eddie Jones and Nick Van Exel to the 1998 game in New York. Joining the Pistons on the East team for the Feb. 19 game in Houston will be Toronto's Chris Bosh, Boston's Paul Pierce and Vince Carter of the New Jersey Nets. The Western Conference reserves are guards Ray Allen of Seattle and Tony Parker of San Antonio, and forwards Dirk Nowitzki of Dallas, the Clippers' Elton Brand, Memphis' Pau Gasol, Minnesota's Kevin Garnett and the Suns' Shawn Marion. Billups and Hamilton are among the five first-time selections, joining Bosh, Parker and Gasol. Despite playing in the NBA Finals the last two years, recognition had come slowly for the Pistons during the season in recent years. Ben Wallace was Detroit's only All-Star in each of the last three years, and the Pistons haven't had multiple selections since Grant Hill and Jerry Stackhouse in 2000. "What they have done the first half of the year, I wouldn't have disagreed with five," said Mavericks coach Avery Johnson, who will coach the West.